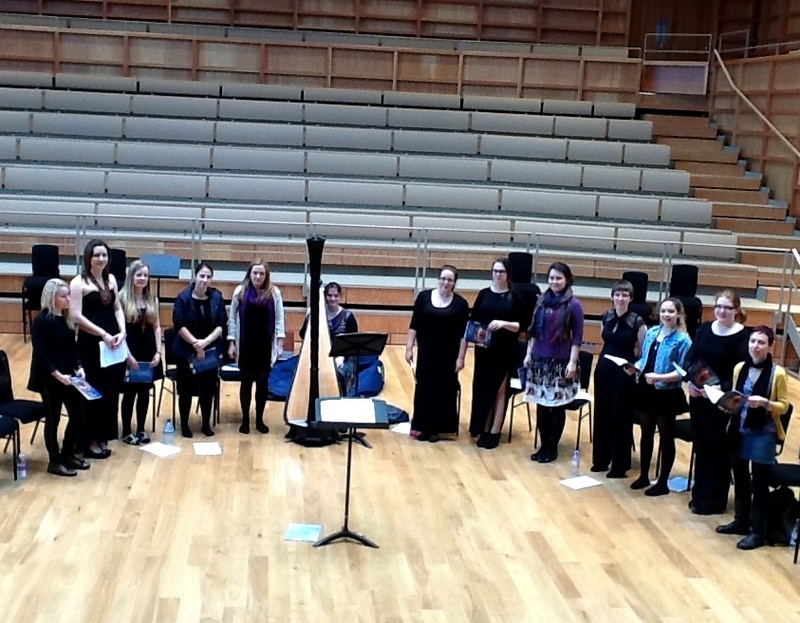 The University Cecilian Choir has been rehearsing industriously for its concert as part of this year’s Britten centenary celebrations, including working on the Ceremony of Carols together with second-year harpist, Emma Murton. The concert looms this Wednesday, with the additional prospect of hearing other music by Brittten – a short fanfare for three trumpets, and two folksong settings, the lachrymaic O Waly Waly and the regret-tinged Down By The Salley Gardens, which will be sung by two sopranos, Paris Noble and Kathryn Cox. Also in the programme are two choral pieces from the preceding era, Mendelssohn’s Abendlied and Debussy’s star-light Nuit d’Etoiles, from the Cecilian Choir with pianist Sharon Yam, plus the reading of two poems. A veritable cultural feast; come and see it this Wednesday, 1.10pm in the Colyer-Fergusson hall – admission free! 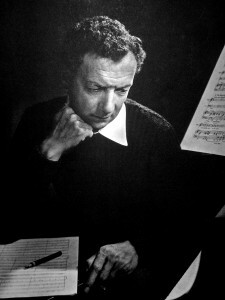 This entry was posted in In rehearsal and tagged Britten, Cecilian Choir, Ceremony of Carols, Debussy, lunchtime concert on March 18, 2013 by Daniel Harding. 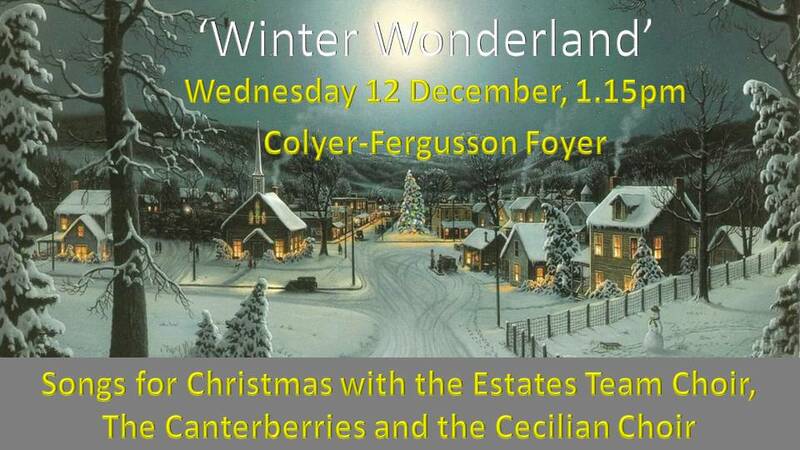 Christmas fever has hit members of the Estates Team, who (as regular readers of the blog will know) have recently formed their own Choir; led by Deputy Director of Music, Dan Harding, the Choir will be making its debut in an informal lunchtime concert on Wednesday 12 December in the new Colyer-Fergusson Building. The Estates Team Choir will sing versions of ‘Winter Wonderland’ and ‘Santa Baby,’ whilst also in the programme will be two pieces sung by the University Cecilian Choir and some festive a capella songs from student vocal trio, The Canterberries. The event is a department Facebook Event page online here: sign up! 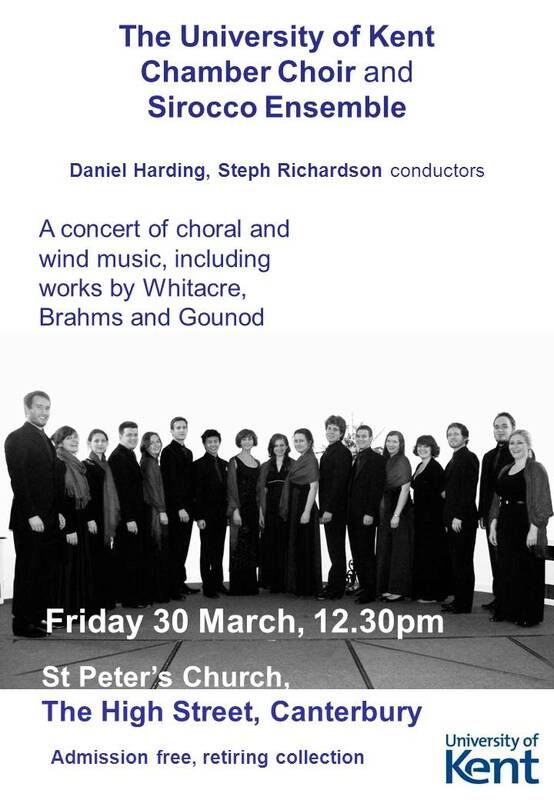 This entry was posted in Concerted effort and tagged Canterberries, Cecilian Choir, Estates, lunchtime concert on December 4, 2012 by Daniel Harding. We’ve spent the past two weeks exploring new repertoire for our concert in June, but last night returned to a distilled section of our Crypt Concert programme to prepare for a lunchtime concert a week on Friday. Having spent the previous weeks looking at works by Schutz, Gorecki and Tippett, last night was time to resurrect pieces from the concert last month, ahead of the concert at St Peter’s. Floating through the first piece of plainsong and through into ‘Dawn,’ it felt like we were finally home again. Two weeks sojourning amongst new repertoire, and we’d finally come back where we belonged. It’s a testament to how much we’d prepared for the previous concert that all the pieces were recalled near-perfectly; there was some dynamic scope to remind the group to explore, but the pieces were all there, as they had been in the Crypt. Returning to a selection of the pieces for next week, it made me realise how much work had gone into the Crypt concert, and how lovely it was to go back to it. There’s a feeling of relaxation amongst the group, now that the pressure of the previous concert has been lifted; last night, the Choir sang with a new-found freedom, more assurety, than in previous rehearsals. Having performed them publically, we now know we can bring them off, and so we’re performing with a greater sense of accomplishment. 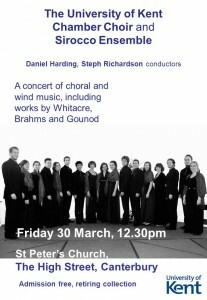 This entry was posted in Sound thinking and tagged Chamber Choir, lunchtime concert, St Peter's Church on March 21, 2012 by Daniel Harding.